The same is true of “cooperation and peace with everyone, because only in peace can they continue to build and elevate our one and only Serbia,” Vucic said in Belgrade, according to the Serbian government. Speaking at a ceremony at the Sava Center on the occasion of the 100th anniversary of the liberation of Belgrade in the First World War, Vucic said that Serbia must respect itself and that just as she knew back then how to defend her freedom with weapons, if someone threatens that freedom today she will again know how to defend it. I am asking everyone not to understand all this that I say as our weakness, because as we knew in 1914, 1915 and 1918 to defend and liberate our Serbia, we will succeed in the future if someone touches our country, said the President of Serbia. According to him, after the breach of the Thessaloniki (Macedonian) front, the First Army of Voivoda Peter Bojovic was chasing the enemy non-stop, going from one assault to another, it freed Serbia all at once, from its south – Vranje, Vladicin Han, Grdelica and Leskovac to Nis, from where the occupying forces were expelled on 12 October 1918. 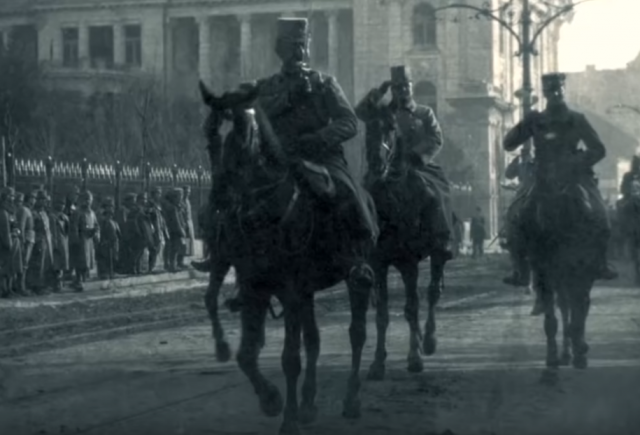 He recalled that in just 46 days the Serbian army, in a liberation move, passed 800 kilometres from Thessaloniki to Belgrade, when the Komitas entered Belgrade on this day in the early dawn in 1914, as predecessors of the First Army. Vucic pointed out that somewhere in this city, among the memories that have been so often built one over another, in the streets that have crossed through centuries, in its turmoil in the history which is magical as much as the city itself, there is still that old trace – the First Army, November, Bojovic, freedom and Belgrade. The name that throbs like a thunder from the clouds of the sky, as described by Crnjanski. 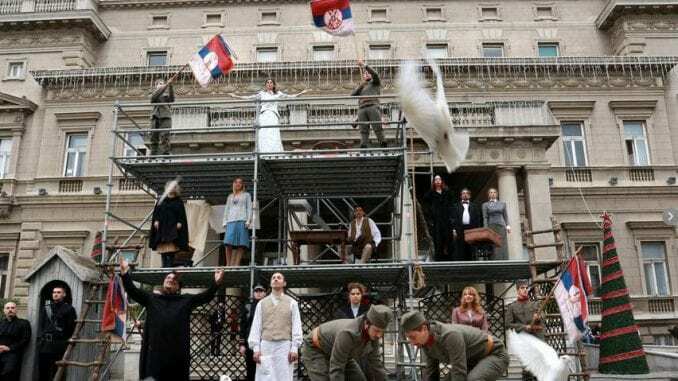 In the less than 37 months since the heroic defence of Belgrade in October 1915, the legendary command of Major Dragutin Gavrilovic was finally executed: “The face of Belgrade, our capital will be bright!”, said Vucic. He said that the ravages of the looted city, the fire and the smoke of the burned magazines, the ruined railway station, along with the previously destroyed most important institutions of Serbian identity and culture, from the Saborna Church and the Serbian Academy of Sciences and Arts, to the National Museum, the National Theater, the demolished Ruzica Church, schools and hotels, were found by the liberators of Belgrade after the occupier’s army retreated. 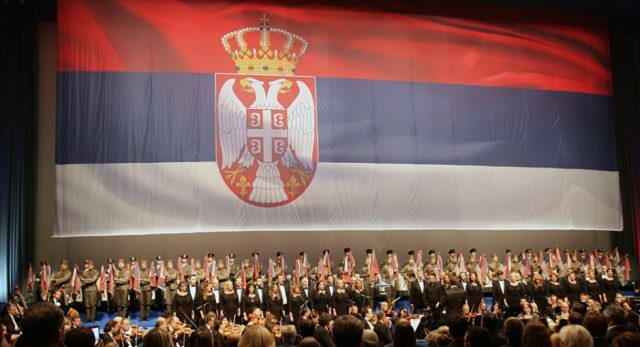 The ceremony in the large hall of the Sava Centre was attended by Speaker of the National Assembly of Serbia Maja Gojkovic, ministers Zorana Mihajlovic, Sinisa Mali, Nela Kuburovic, Branko Ruzic, Nebojsa Stefanovic, Aleksandar Vulin, Aleksandar Antic and Zoran Djordjevic, Mayor of Belgrade Zoran Radojicic, President of Vojvodina government Igor Mirovic, NBS Governor Jorgovanka Tabakovic, Serb Republic President Milorad Dodik, Serb Republic Prime Minister Zeljka Cvijanovic, as well as representatives of the army, churches, public and cultural life. The wreaths at the French Military Cemetery and the Memorial to Defenders of Belgrade at the New Cemetery were laid by Mayor of Belgrade Zoran Radojicic, Envoy of the President of the Republic Nikola Selakovic, State Secretary at the French Ministry of Defence Genevieve Darrieussecq and US Ambassador to Serbia Kyle Scott.